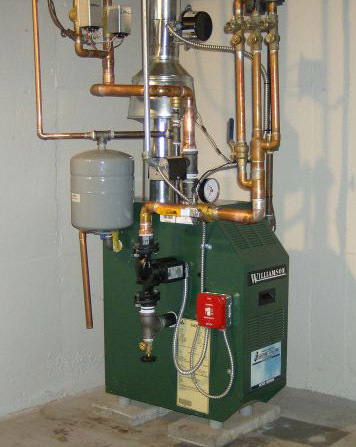 Boilers in Minneapolis are often found in older homes. If the boiler is more than 20 years old, it has already surpassed its life expectancy. Mill City Heating & Cooling has found parts will begin to fail more frequently, resulting in a homeowner being left without heat at the peak of the cold season. If the temperatures are cold enough outside and the homeowner hesitates to have the boiler serviced immediately, freezing in the radiant pipes, radiators and even the boiler itself will likely happen. It is a good idea to replace your boiler once it is over 20 years old, such as one of our customers in Northeast Minneapolis recently did. Our customer had a boiler in need of frequent repairs due to failing parts in the middle of the last year’s winter. Knowing it was highly likely the same problems would occur this year winter as well, he decided to have his boiler changed out with a new Weil McLain boiler and had a new radiator installed in the unheated basement water closet. The customer can now put his mind at ease knowing that he will not have to deal with unpredictable boiler problems in the middle of winter.